Christine Ren, is making waves with her thought provoking art, drawing attention to environmental issues. Her piece entitled, “Blind Spots” is mind blowing. A satirical piece, sparking conversation about environmental concerns as it makes an interesting commentary on society’s consumption of plastic. The portrait of a girl blindfolded with a shopping cart full of plastic products that are cascading out of the cart and into the ocean, is perfectly constructed to highlight society’s behavior in terms of not taking ownership or responsibility for the massive accumulation of plastic that has over years been dumped into the ocean. It shows how easy it is for society to lose sight of critical environmental issues that are right in front of us and problems that are increasing. And, if not lose sight of a glaring issue, the ease and ability we have to push it out of our minds or into our blind spots to avoid dealing with it. Christine’s art forces us to stare at the blatant issue of plastic pollution and face the reality of a situation we would rather remain in our blind spots. The powerful image carefully articulates the theme of being blind. Commenting on society all too easily turning a blind eye towards our actions of contributing to the growing problem of plastic pollution in the ocean and being oblivious to the consequences incurred. Furthermore, the picture depicts the nonchalant attitude of society feeding into the over consumption of plastic products and not questioning what happens to those products when they filter their way into the ocean. Society is deeply entrenched in a dependency on plastic products and over consumption. The image brings forth the notion, of a cautionary warning if we continue down this path and ignore the urgency to a call to action to change our consumption behaviors, recycle more, reduce plastic waste, reduce our use of plastic and reduce the amount of trash that overall ends up in the ocean, our ocean will continue to suffer greatly. The theme of blindness is intricately woven into the artwork, creating a true representation of our culture today. It examines our culture of consumption and plastic becoming a facet of our daily lives. It captures a startling truth about ourselves, we would prefer to be blind to. We would prefer to be blind to how much we have contributed to the deterioration of the health of the ocean, coral reefs, fragile ecosystems and marine life by allowing more than 8 million tons of plastic to be dumped into the ocean every year. We would prefer to close our eyes and not see the reality of the situation we have with the proliferation of plastic and the massive environmental problem that has rapidly become. We would prefer to not know the extent of the consequences of our actions and how deeply and greatly it has had a negative impact on the ocean and the environment as a whole. It is easier to turn a blind eye, keep the problem with plastic out of sight, out of mind rather than face it and deal with it. But, we cannot remain blind. Nor, can we ignore the issue and pretend like the peril our ocean and increasing problems it faces because of plastic pollution does not exist. We can no longer carry on allowing major environmental concerns to fall into our blind spots. We need to shift our focus and make a commitment to change our actions for the betterment of the environment. The image of a girl blatantly oblivious to plastic consumption habits that results in trash ending up in the ocean emphasizes the notion that society cannot stand by any longer in a passive state and be relaxed about such an imperative issue as plastic pollution in the ocean. We must remove the metaphoric blindfolds and open our eyes to the striking reality of our ocean being in crisis. Environmental concerns about plastic pollution in the ocean must shift to the forefront, it can no longer remain in our blindspots. Christine Ren’s bold image, “Blind Spots” is a catalyst for change. Through her passion for art, media, film and advocacy for the environment she is urging us to examine our daily use of plastic and work towards reducing the amount of plastic we use. She encourages us to acknowledge our part in contributing to plastic pollution in ocean and seek out measures that can be taken to help resolve this issue. Her satirical portrait speaks volumes, pushing us to all be more active in creating change and not stand by passively allowing plastic pollution and over consumption of plastic products to continue. 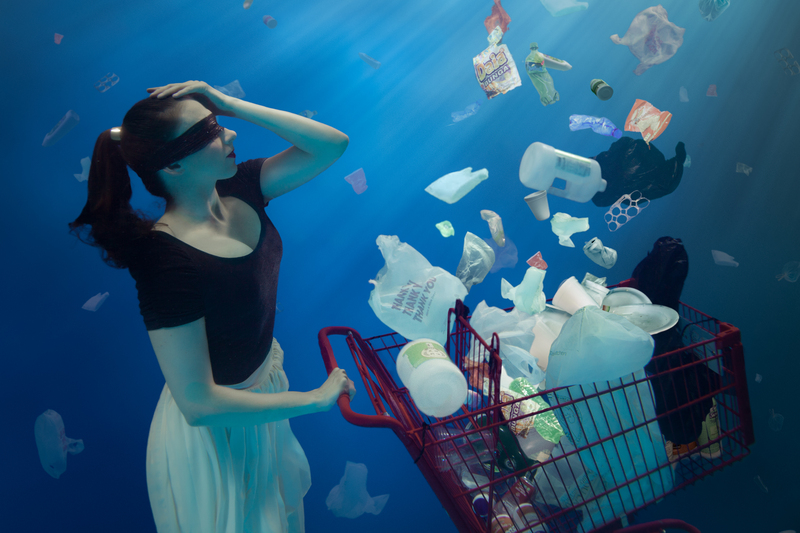 The striking image provokes us to be environmentally responsible as it emphasizes the urgency to rectify our consumer habits and the devastation we have allowed to be inflicted upon the ocean. We cannot afford to be careless with the products we consume. We must not allow plastic products to continue ending up as marine debris. The ocean is not a trash can. The ocean is vast, but it is not invincible. There are serious repercussions due to plastic pollution. Marine debris is a major threat to marine life and plastic is the most prevalent form. Often marine life ingests plastic as it is mistaken for food, or become entangled in fishing lines, and plastic debris often resulting in their death. Microplastics is a major concern as it is prolifically polluting the ocean and harming marine life. Microplastics are tiny plastic pieces that resulted from larger plastic debris that degrades while in the ocean. Plastic is everywhere. Plastic pollution is serious threat to the ocean and an endangerment to marine life. We need to collectively strive to keep plastic out of the ocean. We can do so by reducing our use of plastic, recycle and remove trash along the beach and directly from the ocean. Christine Ren is a revolutionary and talented artist. 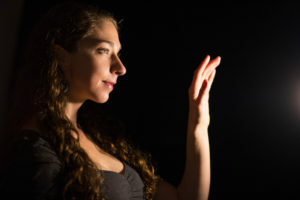 She has merged her passion for the arts with her advocacy for the environment to promote positive change. She uses art and media as her platform to voice her concerns for the environment and to provoke a conversation about environmental issues and resolutions to remedy the problems our planet faces. Art direction and modeling by: Christine Ren and Photography by: Brett Stanley Photography.